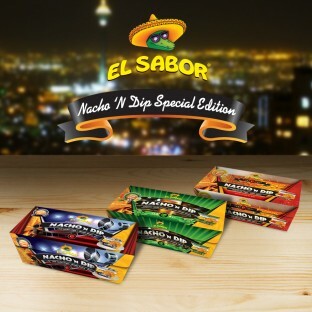 El Sabor created three new Nacho n’ Dip products in order to enjoy every single moment. You love cold beer? El Sabor recommends you the Nacho n’ Dip «Beer Time». Crispy nachos with a unique salsa sauce is the right flavor to pair your favorite beer . Your friends are coming in about ten minutes to watch the big football game! You ‘re still thinking what delicious snacks you’ll taste will watching the game? The El Sabor Nacho n’ Dip «Pub Time» is the answer: nachos with Jalapeno Cheese sause. You watch your favorite game, eating Nacho n’ Dip and your senses will… explode! As for cinephiles , El Sabor has created their own Nacho n’ Dip, named as «Movie Time»! The delicious Chili Nacho Chips (with Cheese Sauce in the package), will charm the big screen fans with the delicious result. The enjoyment of the moment finally has a name! It is called El Sabor Nacho n’ Dip Special Edition. You only need to try them… because the fun begins from the taste!